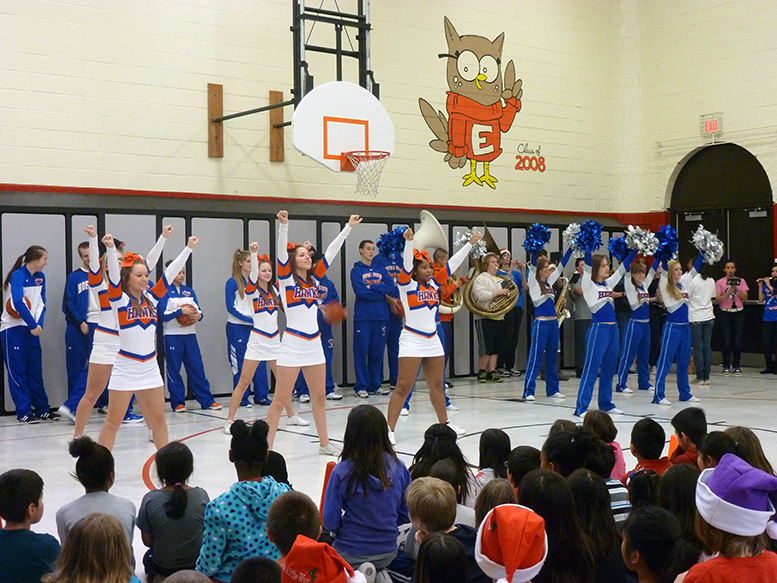 Students from Hoffman Estates High School’s cheerleading, pom poms, band, and girls’ and boys’ basketball teams participated in the assemblies. To help excite elementary students about reading, high school students at Hoffman Estates High School traveled to seven local elementary schools to put on assemblies about their reading program. 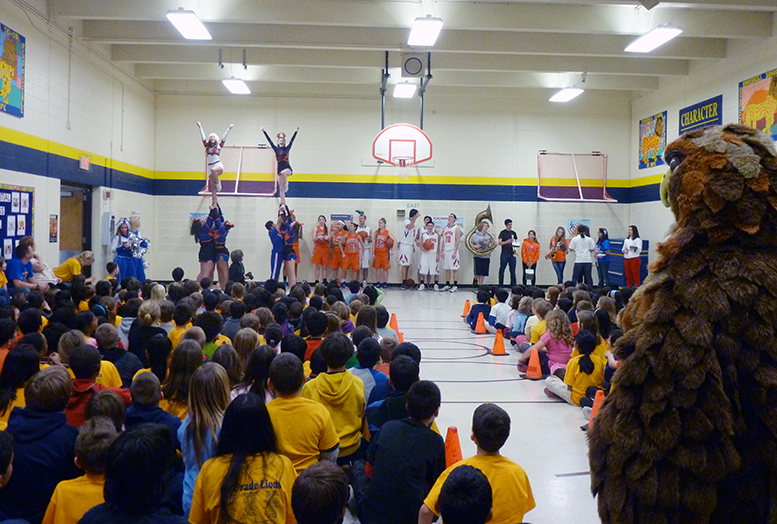 Joining the Hawk mascot, members of the HEHS girls’ and boys’ basketball teams, pom poms, cheerleaders, and band traveled to the schools to tell elementary students a story about reading and share information about their winter reading program. These assemblies took place on Dec. 20 and 21. The participating District 54 schools include: Anne Fox Elementary, Armstrong Elementary, MacArthur International Spanish Academy, Winston Churchill Elementary, Albert Einstein Elementary, Blackwell Elementary, and John Muir Literacy Academy. 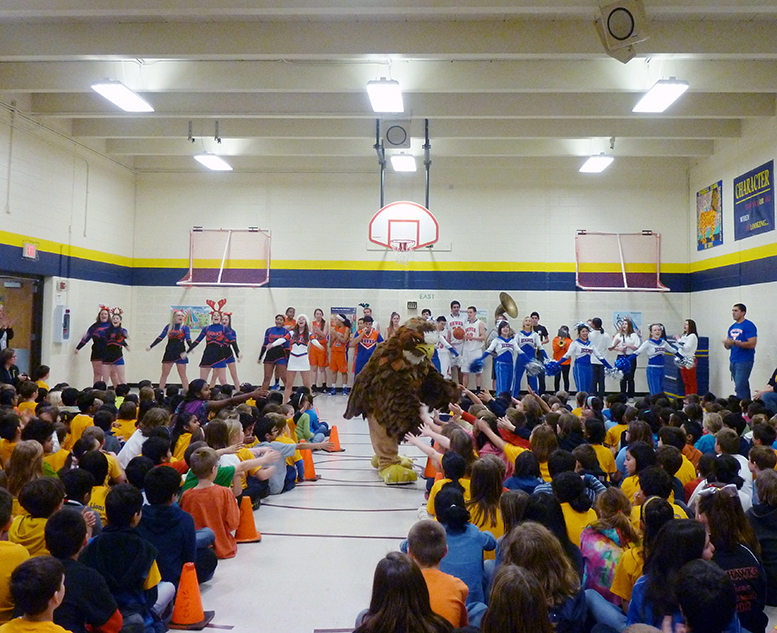 Students in District 54 were happy to see the HEHS hawk mascot. Students at Winston Churchill Elementary School showed excitement for reading while cheerleaders performed stunts. 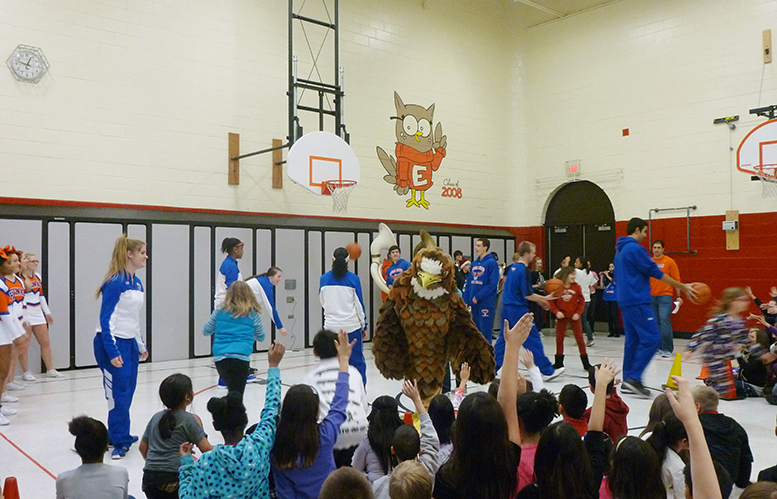 During the assemblies, senior basketball players from HEHS shot hoops with some of the elementary students. Pom poms performed a short dance routine, and cheerleaders performed stunts that correlated with the story they were telling. Moersch said each team brought one junior so they could be leaders next year. Students who participate in the program are required to read a certain set of books which is determined by their teacher. If they reach that goal by the second week of January, they are given a voucher to attend a Hoffman Estates High School varsity boys’ basketball game on Jan. 18. There, students will be recognized for their reading efforts at halftime, and will be eligible to participate in games and receive prizes. Students at Albert Einstein Elementary shoot hoops with the girls’ and boys’ varsity basketball teams. Moersch, who is a former teacher in School District 54, said this event was modeled after Conant High School’s Booking with the Cougars program. He said he wanted to bring the program to HEHS and carry on the event as he had seen it when he taught at the elementary level.